Blik and Wee Gallery have cottoned on to the new craze for banners in nursery decor! 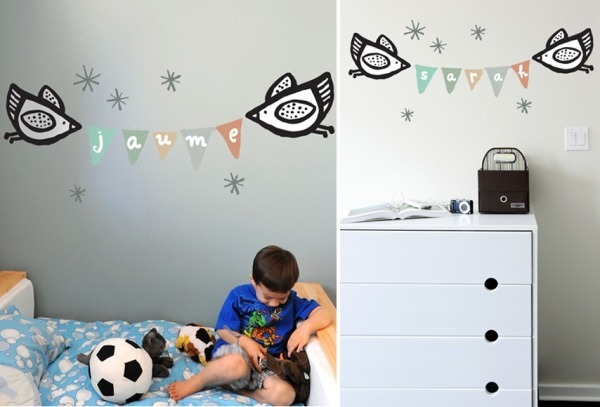 Grab these charming decals and personalise those walls with beautiful Wee Gallery black and white birdies, complimented beautifully by a softly-coloured banner. Included in the pack are two birdies, fifteen banner pieces, five stars plus seventy-eight alphabet letters! Newborn babes will be able to see the birdies and once they are toddlers, the magic of the coloured banner will amuse. We’ve featured Wee Gallery’s Flash Cards before and Blik products have long been a Babyology favourite. The Wee Gallery Birdie Banner is a part of the Re-Stick range and can be repositioned. The kit is US$38 plus shipping, from Blik.